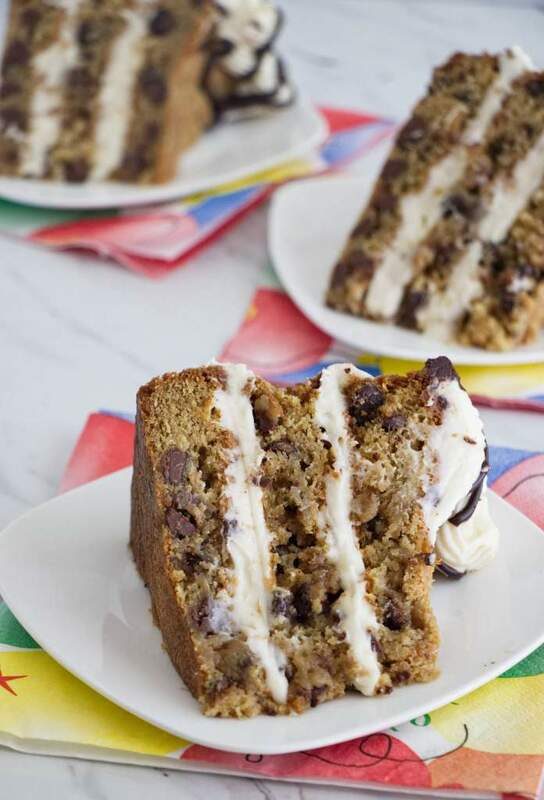 This towering chocolate chip cookie cake consists of three deep dish chocolate chip cookies that are stacked and layered with cream cheese frosting. This is the ultimate chocolate chip cookie cake with cream cheese frosting. It is three layers of deep dish chocolate chip cookies that have been slathered with cream cheese frosting between the layers. This is a cake that will satisfy any cookie monster. What do we have here? A cake? A cookie? Cookie dough gone crazy?? Yes, yes, and yes! This is a soaring tower of giant, chewy, deep dish chocolate chip cookies. But it doesn’t stop there. 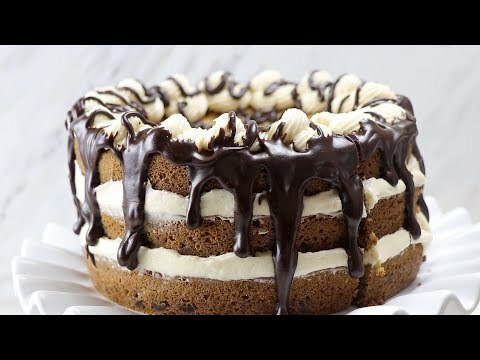 We filled the cookie cake layers with a creamy, light, and fluffy cream cheese frosting then drizzled with a rich chocolate sauce. It’s madness! And I mean that in a good way. If you’re mad about chocolate chip cookies, this is the cake for you! The cookie base is moist, chewy and chocolatey. The center is just barely under-baked. But not so under-baked that you can’t stack it in a layered cake monument. We loaded this chocolate chip cookie cake with chocolate chips. As any chocolate chip cookie should be. The frosting is a perfect match for this cake. It is a not-too-sweet but oh-so-decadent cream cheese frosting. Then a rich chocolate drizzle puts this masterpiece over the top. This is chocolate chip cookie utopia in the form of a cake. You need this recipe! You have to make this cake. You don’t have to be a fancy pants baker to make the worlds best chocolate chip cookie cake. And yes, this is the worlds best chocolate chip cookie cake. It might look intimidating with three layers but it is as easy as pie… err, cookies. We made the cookie layers by spreading the cookie dough into three cake pans. But there are some secrets to getting the chewy, tender texture of these giant cookies. The first secret to getting a dense, chewy texture is to start with melted butter. Melted butter is one of the things I love about this recipe. No worries if you forget to let your butter sit out and soften. Just stick it in the microwave or in a saucepan and let it melt. Melted butter creates a denser, chewier cookie. That’s tip number one. Tip number two, and the other secret for a dense, chewy and moist cookie is the addition of egg yolks. Why does this recipe call for two eggs AND two egg yolks? The additional egg yolks add more fat which keeps the cookie tender, moist and chewy. 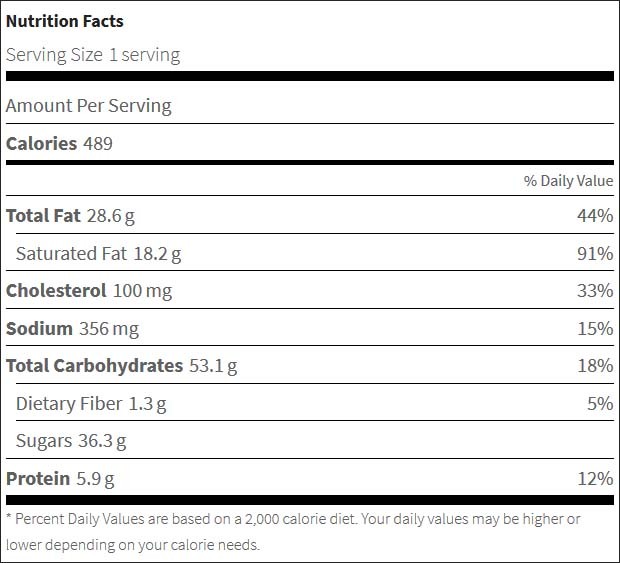 You might wonder why we don’t just add more fat in the form of more butter.? Too much butter will make the cookie layers greasy and prevent them from baking completely. The rest of the recipe is pretty standard. If you can make cookies, you can make this chocolate chip cookie cake with cream cheese frosting. What kind of pans do you need for this cake? Normally, when I make a cake I use good quality cake pans that are at least two inches tall. Since this isn’t a standard ‘cake’ but a cookie cake, you really don’t need to use a very deep cake pan. For this recipe, if you don’t have three regular sized cake pans, you can get away with a few cheap dollar store cake pans. The cookie dough will have some rise but not to the same extent as a regular cake recipe. 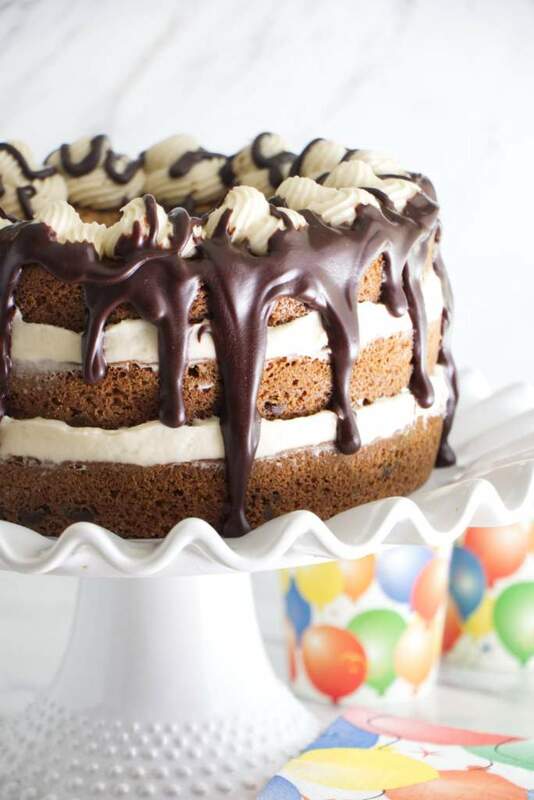 So go get some dollar store cake pans and make this cake/giant layered cookie for someone. This towering chocolate chip cookie cake is made with three deep dish chocolate chip cookies that are stacked on top of each other and filled with cream cheese frosting. 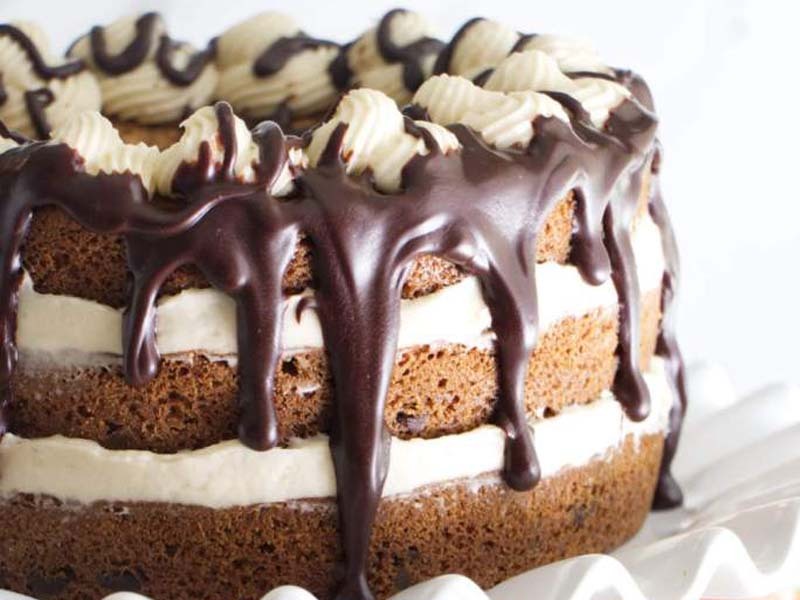 It is finished with a rich chocolate drizzle that makes this cake over-the-top decadent. Heat oven to 350°F. Prepare three 8-inch round cake pans by spraying them with non-stick cooking spray and lining them with parchment paper. Melt the butter then place it in a mixing bowl. Add the sugars to the melted butter and beat until combined. Add the eggs, egg yolks, and vanilla. Beat until creamy. Stir the flour mixture in by hand. Do not over-mix. Stir in the chocolate chips. Divide the batter into the three pans. Place in the pre-heated oven and bake for 18 to 20 until the tops are a light golden brown. Add the cream cheese and butter to a mixing bowl and beat on high speed until it is smooth and creamy. Add in the vanilla and salt and mix just until well combined. Add the powdered sugar and beat on low speed until the sugar is moistened then increase the speed. Beat for a couple of minutes scraping down the sides and bottom of the bowl intermittently. When the frosting is smooth and creamy, set aside and prepare the chocolate topping. Add the chopped chocolate to a small bowl. Heat the heavy cream just until it barely simmers then pour the hot cream over the chocolate. Let the chocolate and hot cream sit for 30 seconds to 1 minutes then stir it until it is smooth. Set the mixture aside and let it cool down to room temperature. Once the cookie cakes are cool, stack them on top of each other with a slathering of cream cheese frosting in between each layer. Reserve a small amount of cream cheese frosting to pipe on top of the assembled cake. Drizzle the top and sides of the cake with the chocolate ganache. Stir the flour and chocolate chips in by hand for best results. By stirring the flour by hand you will be less likely to overmix the dough which can make the cookie less tender. Make certain the jumbo chocolate chip cookies have cooled to room temperature before you spread the frosting on them. The frosting will melt if the cookies are still warm.